I kinda feel like I have this vegan thing in the bag… Is it too soon to feel that way? Today’s challenges: I took my 15-year-old son for a milkshake this afternoon and felt a little sad that I couldn’t have one. But, then, I realized I didn’t even want one…so there was no reason to feel sad. Challenge 2: This evening I invited my husband and younger two kids to come with me to take the dog for a walk. I instantly thought it would be fun to walk to our local dairy bar… It was a little weird realizing that being vegan meant treats like that would have to be researched in advance and we’d have to seek out venues with vegan options. 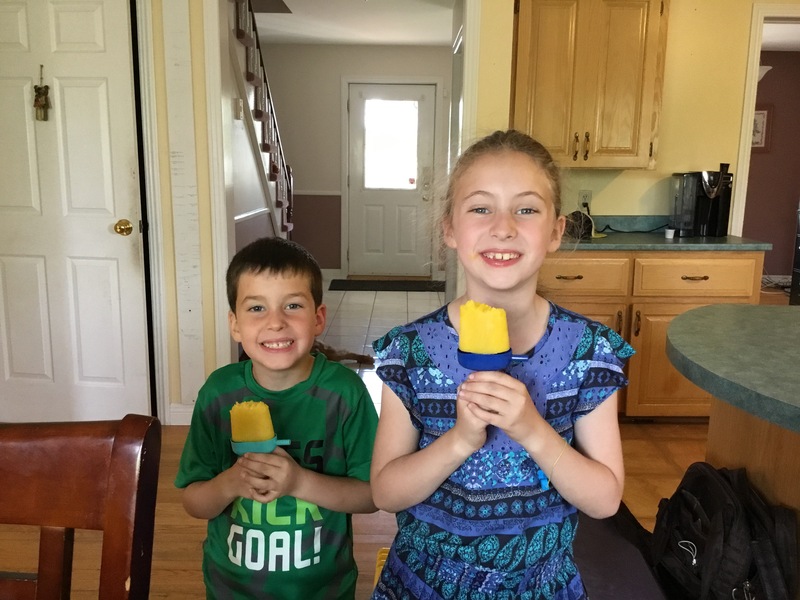 But, for tonight, it was no big deal, because I remembered we’d already had a frozen treat after supper… The mango-lime frozen treats that I made last night! They were a huge hit and consisted of nothing but mango, lime juice and zest, coconut water and a few drops of liquid stevia. No added or refined sugar, no gelatin…no leftovers! They gobbled them all up! Next time I’m going to try making them with strawberries and vegan yogurt! Oh, supper was also a major success. I threw a batch of brown rice in the steamer last night while I washed the mountain of dishes. 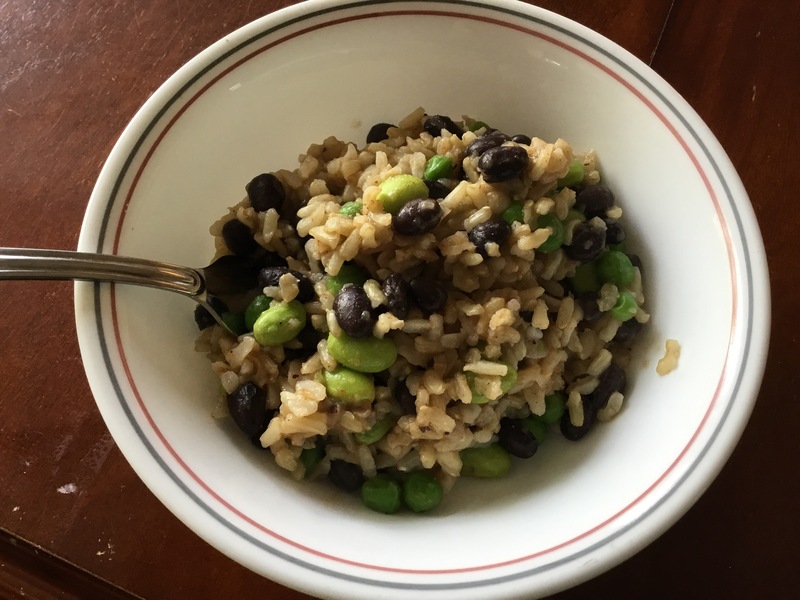 Tonight, as soon as I got home, I tossed it in the wok with some olive oil and added some frozen peas, a can of (rinsed) black beans and some frozen edamame. I wanted corn…but I didn’t have any. I tried to think of some kind of sauce that my kids would eat…but they’re not big on sauce….so, on a whim, I threw in some of my homemade taco seasoning and some extra cumin. Everything was sticking to the bottom of the pan by this point so I threw in some water, turned the heat down a little and put the cover on the wok. A few minutes later, I had this. I was pretty convinced that the kids wouldn’t touch this with a ten-foot pole…let alone put it in their mouths… There were mysterious green things in it after all…not to mention (gasp!) beans. But, I put a few dashes of soy sauce on each of theirs and they gobbled it up without question. They did sing a few rounds of “Beans, beans the magical fruit…” …with some interesting sound effects. My 7-year-old ate every bite of hers and my five-year-old left only a few mouthfuls of his. I was shocked…but said nothing…because I didn’t want them to think that eating this meal was anything out of the ordinary. On a philosophical note, all this success has gotten me to thinking about how it’s never to late to do what we think is right. For me, right now, that means changing to a plant-based diet. I’m not suggesting that’s right for everyone, but it’s right for me at this time in my life. It doesn’t matter that I’ve been eating meat and animal products all along. What I was doing before does not dictate what I’m free to do today. As we trudge through life, we are all just figuring things out as we go along. We don’t always know what is right for us in any given moment. And, what is right for us one day may not be what’s right for us the next day. There’s no harm in changing our minds about what’s right, there’s no rule that says we can’t turn around and start travelling a different path. Heck, there’s no rule that says we can’t change our destination entirely, mid-journey. If we are going through life and we realize we’re doing the wrong thing, we have the prerogative to stop, reevaluate and make a change. And, the beautiful thing is, we can do this 100 times if we want to. There’s no limit on how many times we get to choose our own destiny. I think so often we feel pressure – internal or external – to always be or do what we said (or thought) we wanted to be or do in the past. We said we wanted to go to school to work in a certain field…so we have to work in that field. We said we wanted 2.5 children by the time we were 30, so that’s what we need to do. We said we felt strongly one way about a certain issue, so that’s how we have to feel. But change happens and there’s nothing wrong with adapting as we go. It doesn’t matter how far down the “wrong” path we’ve travelled, it’s never too late to go a different way.